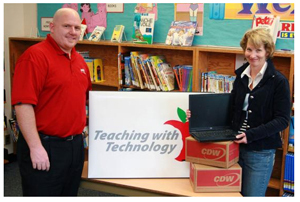 Etobicoke – CDW Canada, a leading provider of technology solutions for Canadian organizations in the public and private sectors, today launched its second annual Teaching with Technology™ Story Contest and Sweepstakes, offering Canadian** educators and administrators opportunities to win information technology (IT) for their classrooms and schools by entering a three-tiered contest. The contest begins today and will run until February 28, 2010. A ‘Story Contest’ allows educators and administrators to submit a description of how IT has improved the learning experience in their classroom or school. ‘Tweet ur Tech Tale’ is similar to the Story Contest, but stories must be submitted via Twitter, and therefore written within Twitter’s 140-character limit. A ‘Sweepstakes’ contest is open to entry by educators and administrators. With up to $18,700 in total prizes, the second annual contest has received generous support from many of CDW Canada’s technology partners including premier sponsors Hewlett Packard (HP) and Microsoft, along with APC, Atdec, Cisco, D-link, Lenovo, McAfee, Oki, Polyvision, Sony, Trend Micro, TrippLite and Xerox. 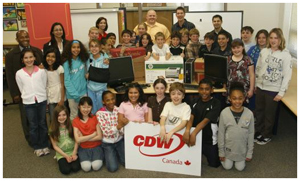 CDW Canada, a valued IT partner to the education sector, understands the importance of leading-edge technology in schools and classrooms. Educators must be equipped with the best IT tools to create an enriching learning environment for students, so the Teaching with Technology program offers Canadian K-12 educators and school administrators three ways to participate and win. The contests are easy to enter, and include interactive elements that provide insight into the many ways educators are leveraging today’s technologies to enhance the education process. To enter the Story Contest – Entrants must submit a short story (200-500 words) that describes how technology (computers, networks, projectors, the Internet, e-mail, software, etcetera) improves the learning experience in their classroom or school. How a teacher or school uses technology to make the learning environment more engaging, effective or enriching in a school, department or classroom. How an educator uses or plans to use technology to achieve an education objective or notable success. Entrants may submit their technology story online, by e-mail or postal mail. Online and e-mail entries must be received by 11:59 p.m. ET on Sunday, February 28, 2010. Mail entries must be postmarked no later than 11:59 p.m. ET on Sunday, February 28, 2010. All entries will be judged by a panel of IT experts based on criteria such as educational value and uniqueness of the technology solution. From the entries received, six winners will be selected to win prize bundles ranging in value from $2,280 to $3,260. Each of the six prize bundles contain technology products that are valuable in today’s classrooms, such as printers, projectors, personal computers, monitors, whiteboards, digital cameras, networking equipment and software (word-processing and anti-virus). To enter the Sweepstakes contest – Entrants simply visit Teaching With Technology to enter for their chance to win one of five prizes. Alternatively, entrants may submit their entry by e-mail or postal mail. Online and e-mail entries must be received by 11:59 p.m. ET on Sunday, February 28, 2010. Mail entries must be postmarked no later than 11:59 p.m. ET on Sunday, February 28, 2010. All entries must include the entrant’s full legal name, title, educational institution and school board where he or she is currently employed, contact address, e-mail address and daytime and evening telephone numbers. Five lucky winners will be selected by random draw. Each will receive a prize such as a Microsoft wireless bundle (including webcam, keyboard and mouse), an HP Mini Netbook, a Sony eBook reader or a Sony Cyber-shot digital camera. To enter the Tweet UR Tech Tale Contest – Entrants must submit via Twitter, in no more than 140 characters, a tweet describing how technology has been used (or can be used) to enhance or improve the learning experience in their classroom or school. Tweets must be posted by 11:59 p.m. ET on Sunday, February 28, 2010. Teaching with Technology is on Twitter. Entrants must use the hashtag #twtcda in their entries. At the end of the contest period, a panel of judges will review all eligible Tech Tweets on the basis of educational value, results achieved (or expected), creativity and more. Two lucky winners will each receive a prize such as a Lenovo Netbook or Sony Cyber-shot digital camera. Complete rules and regulations for all three contests are posted on the Teaching With Technology web site. For more information about the contest, to read last year’s winning submissions or download technology tips for teachers, please visit Teaching With Technology on the web. ** The Contest is open to legal residents of (who are currently living in) Canada . Residents of (who are currently living in) Quebec are not eligible to enter the Contest. This entry was posted on Tuesday, December 8th, 2009 at 9:07 am and is filed under Contests, Education. You can follow any responses to this entry through the RSS 2.0 feed. You can leave a response, or trackback from your own site.